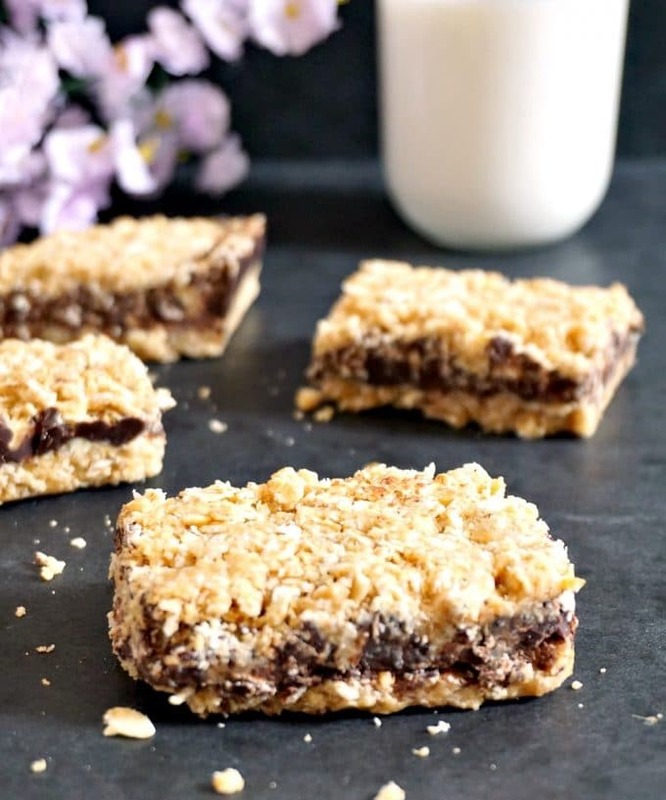 Healthy no-bake chocolate oat bars with peanut butter and apple sauce, a quick and guilt-free snack to boost your energy whenever your sweet tooth craves some sugar. Vegan and gluten free, only 4 ingredients. After making the rice krispies peanut butter balls, l knew that peanut butter and oats make a fine pair together, so l tried another delicious snack using these 2 amazing ingredients. I don’t know why before l was under the impression that oats won’t soften well unless they are baked. 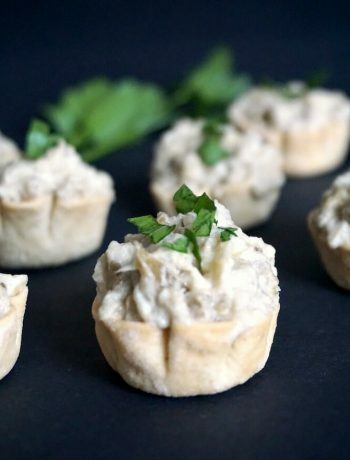 Not only they soften nicely, but they also work so well in no-bake snacks. 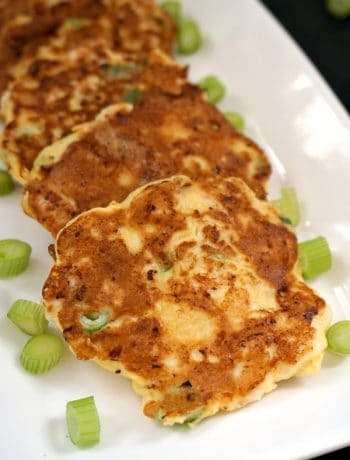 I first tried this recipe with honey, rather than apple sauce, but l wasn’t quite happy with the result. I though honey and peanut butter didn’t really get on well taste wise. There was something else l was after. And then l tried the apple sauce, and the taste was exactly what l wanted. A tiny little bit of sharpness to give the bars a good healthy kick. Wait, l know what some may say, since when is chocolate healthy? Well, dark chocolate is healthy. The good quality one with no nasty ingredient has been proven to have countless health benefits. It’s good for the heart, it’s rich in antioxidants, it reduces the risk of stroke, cholesterol,and it’s good for the brain, no name just a few. The cocoa percentage has to be at least 60 per cent, and obviously, the higher, the better. Some people don’t enjoy the bitter taste, and prefer the sweetness of the milk chocolate, but l think l don’t mind the dark one. However, if you really don’t like dark chocolate, feel free to use milk chocolate in this recipe. Again, a good-quality one is better, to keep the bars on the healthier side. 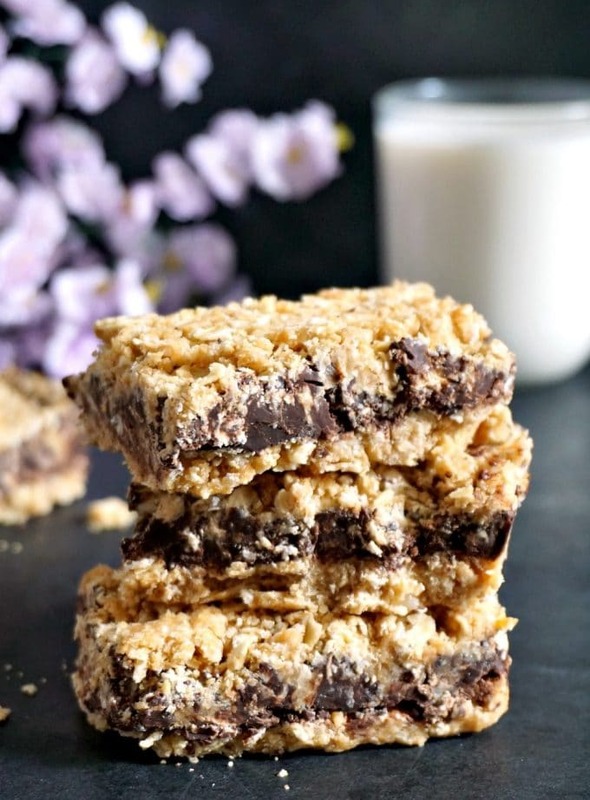 Can you have chocolate oat bars for breakfast? Are these bars good for breakfast? Absolutely, get yourself a cup of tea, coffee or a nice glass of milk, and enjoy. They really work wonders, getting you ready for the long day ahead. Speaking of long days, mine are ridiculously long, little ones always make sure of that. Bring me all the energy bars, l so need them! If not, they are an excellent snack whenever hunger strikes. 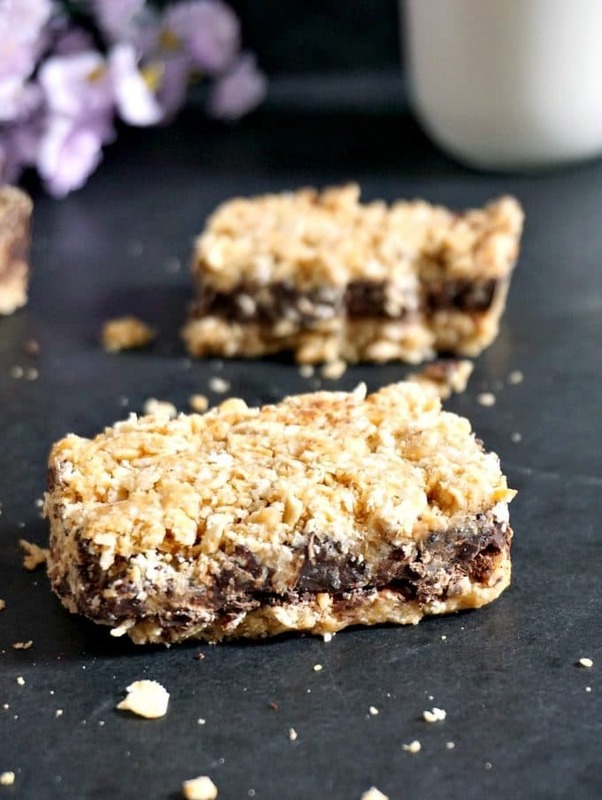 How do you make healthy chocolate oat bars? There is some debate whether eating uncooked oatmeal is good or bad for you. And the idea is that it’s safe to be consumed if it’s soaked in some sort of liquid first. Now, the apple sauce is pretty moist, and together with the peanut butter soften the oats very well. But, if you want it a lot softer, soak the oats first in water or milk, drain well, then follow the same steps. Melt the chocolate, spread half of the oatmeal mixture over a tray, then spread over the chocolate, and top with the remaining oats. As far as the tray is concerned, use either a square or rectangle one, a non-stick tray is ideal. Mine is a 20X20cm, but if it’s smaller or larger, it doesn’t matter much. You can also line it with non-stick baking paper if you want to remove the bars quickly, although l think it’s better to cut the bars while they are in the tray. The easiest part is eating them, of course 🙂 I managed to cut 6 bars out of the ingredients used, so use more if needed. The keep well in an air-tight container, and can be made the night before. And that’s it, a healthy home-made snack that is so delicious. If you’ve liked my HEALTHY NO-BAKE CHOCOLATE OAT BARS or any other recipe on the blog then don’t forget to rate the recipe and let me know how you got on in the comments below, I love hearing from you! You can also FOLLOW ME on FACEBOOK, and PINTEREST to see more delicious food and what I’m getting up to. 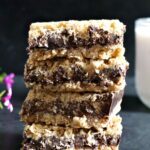 Healthy no-bake chocolate oat bars with peanut butter and apple sauce, a quick and guilt-free snack to boost your energy whenever your sweet tooth craves some sugar. In a bowl, combine the oats with the peanut butter and apple sauce. `Line half of the mixture onto a 20x20cm (7x7 inches) tray, and press it down with the back of a spoon. Break the chocolate into pieces, transfer to a heat-proof bowl, and place over a pan of simmering water to melt. Remove from the heat, pour the chocoate over the oat mixture, and top with the other half of the mixture. Leave to cool for at least 2-3 hours, so that the chocolate can harden. Use a sharp knife to cut 6 bars. Yay! 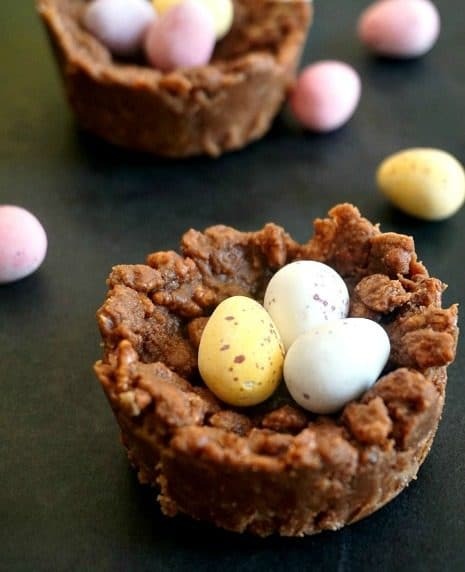 A no-bake treat is always a winner for me. Did you bring more of these? These will be gone too soon here at Fiesta Friday party. Thanks for sharing – these look amazing!